Amidst all of the hype and hubbub of Donald Trump and Bernie Sanders and Hillary Clinton's emails, we thought it was a good time to bring everyone back to 'First Principles', particularly for you young people of this country. You have 40-70 years, assuming you are blessed with good health and long-life, to live in America, if you so choose, and the decisions you make in the 2016 election are very important to you. You are either going to vote for candidates who support policies that will lead to millions of great new jobs for you and your friends. You are either going to vote for candidates who support freedom and security for America for the rest of your life. You are going to vote for candidates who can read, write, add and subtract and understand budgets. All these decisions are up to you. But first you need to know some facts. The first pie chart above is the breakdown of the federal budget in FY2015 today. Take a look at it. Study it. Burn it into your memory banks for all future political discussions you may have. The second pie chart (below) is from FY 1984, the last year of President Reagan's first term in the White House and the year we ran for Congress, primarily because we were 'terrified' of the massive budget deficits back then that were leading to the 'exploding' national debt at the same time. The budget deficit in 1984 was $183 billion. The national debt was $1.3 trillion. The entire federal budget was $852 billion. The budget deficit in 2015 is about $500 billion. Almost 2/3rds what the ENTIRE FEDERAL BUDGET WAS IN 1984! The budget deficit for most of President Obama's 6 years in the White House was over $1 trillion PER. YEAR! Far more than the entire annual federal budgets under President Ronald Reagan in his first 4 years in office. The overall national debt today is over $18 trillion heading towards $19 trillion. Net national debt (debt held by the public and not intra-governmental borrowing) is $13.4 trillion. The federal budget today is just under $4 trillion. You will notice the share of the federal budget now dedicated to defense/homeland security is now 16.2%. 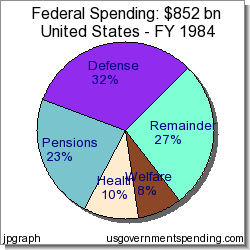 In 1984, defense alone accounted for 32% of the federal budget. There was no 'Homeland Security' until post-9/11. What has happened since 1984 is that the federal entitlement programs have not been reformed or reduced in any appreciable manner, way, shape or form. Federal health programs, mainly Medicare and Medicaid, accounted for just 10% of the federal budget in 1984. Social Security accounted for 23%. Today, federal health programs, Medicare and Medicaid, now account for 28% of the federal budget, not 10% as in 1984. Social Security is only up to 25% of the federal budget. The programs that have been crushed by this growth in Medicare and Medicaid have been the rest of the federal budget, the so-called 'discretionary programs' that cover the programs many of you want to see continue. Transportation, education, energy, environmental protection, housing...you name it, it is probably in the discretionary part of the budget. The size of the defense budget has relatively been 'crushed' as well in terms of its percentage share of the overall budget. Defense is now about 50% as large as it was in 1984 in relative terms of share of the federal budget. 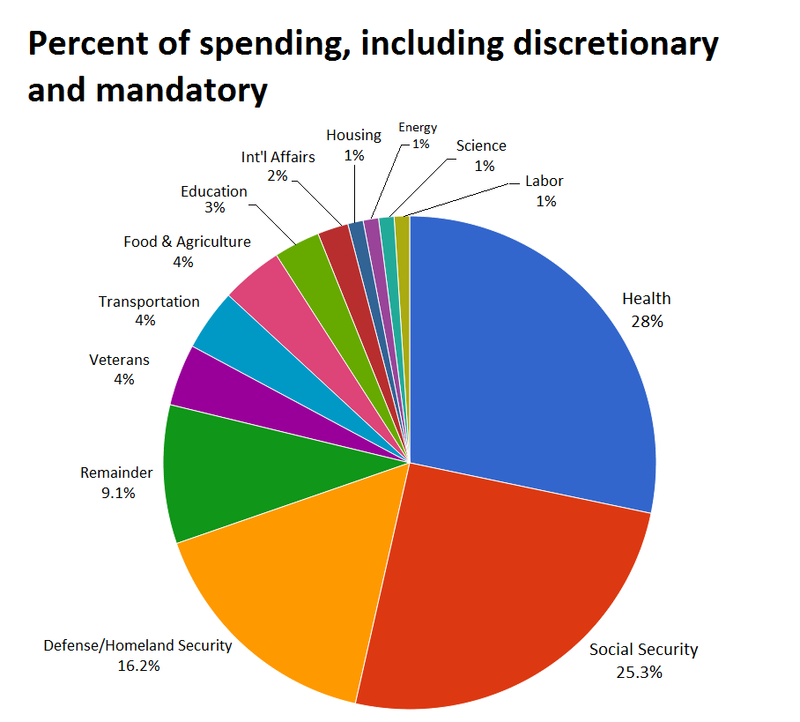 Close to 70% of the federal budget in 2015 is made up of entitlements, defense and interest on the national debt, all somewhat considered as the 'mandatory' part of the budget today. We need a strong defense today, perhaps more than at any time in the last quarter century. Social Security, Medicare, Medicaid and interest have to be paid regardless of any other considerations. You have a lot at stake in the 2016 elections, don't let anyone try to fool you that you don't. Perhaps the most important things the next President can and should do for you and your generation, and America in general, is arrest the overall rate of growth in federal spending; hold it to about 3% annual increases for the length of a presidential term or two, reform entitlements; instigate a massive economic growth surge that will generate enough revenue to not only balance the budget while holding spending down to 3% annual increases and then start paying down this enormous national debt before it is too late. You just have to pick the 'right' candidates, especially for President, who can help make your life better for the rest of your natural-born days here in Planet Earth. As long as you live in America that is. Good stuff, Frank. Sadly, I think most Americans are asleep at the wheel and cannot imagine the implications of these staggering facts on life in America and our opportunity to fund priorities and generate prosperity amid the drag of this debt load. Still, we must keep up our work to sound the alarm. Donald Trump As Teddy Roosevelt?